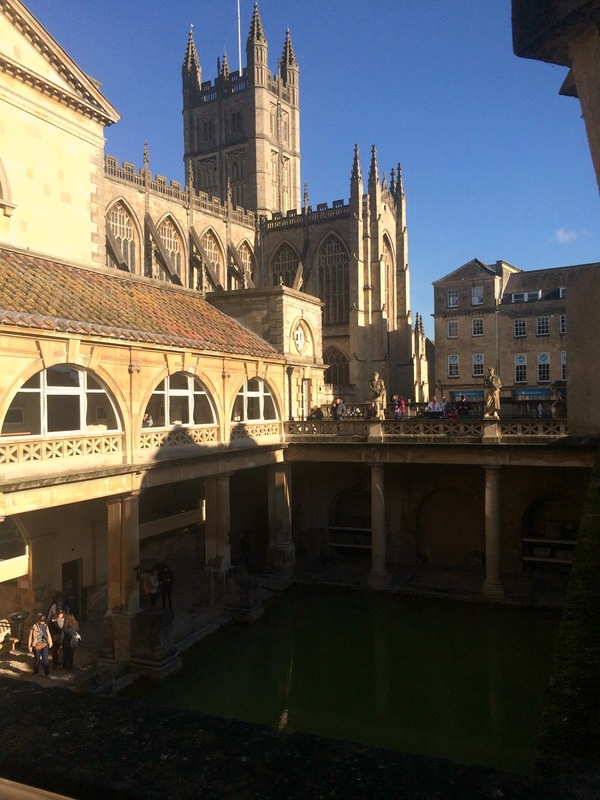 For the three people who haven't the foggiest about it, Bath is in the county of Somerset in South West England. 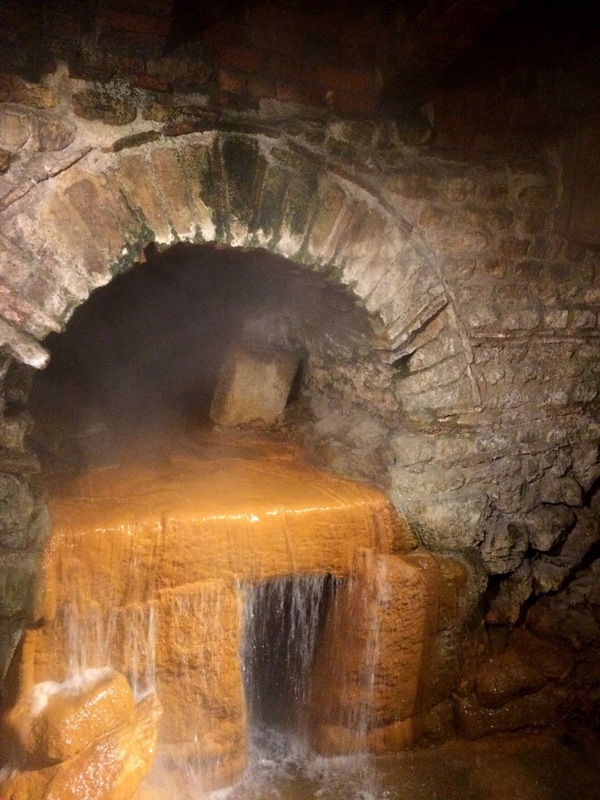 It is home to geothermal springs which the Romans built baths in, in around 60 A.D., forming a spa town with the Latin name of Aquae Sulis meaning Waters of Sulis. Sulis was actually a goddess of Celtic Britons but the Romans identified their own goddess Minerva with her, and worship of Sulis continued. 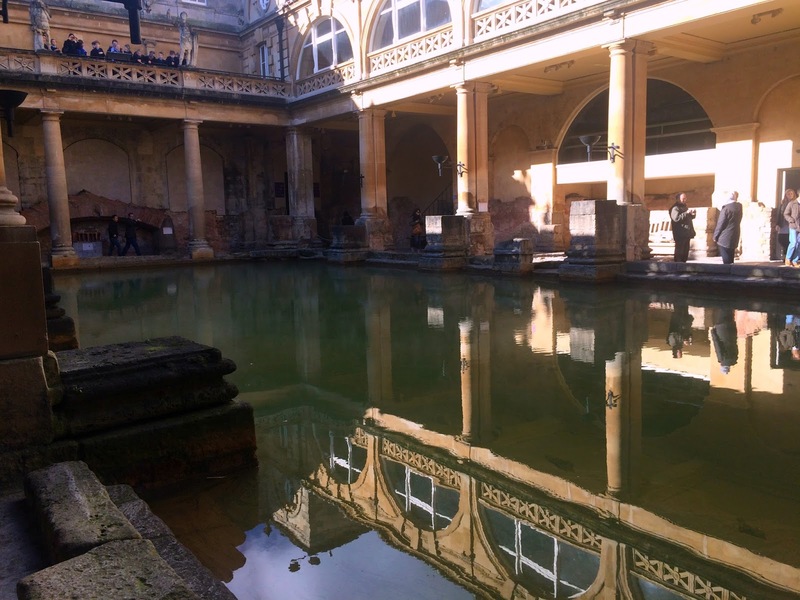 Following the withdrawal of the Romans from Britain, most of the baths fell into disrepair with some claiming the original baths were destroyed entirely. The site had been redeveloped many times over the following centuries but was most notably re-established during the Georgian period of the 18th century. The Georgians seemed to bloomin' love a spa town, believing as the Romans and Celts did that the water was healing. 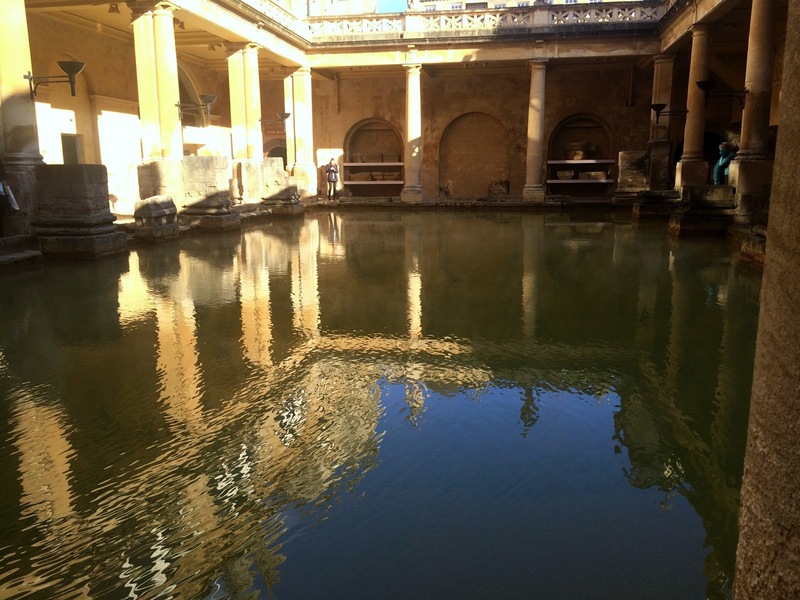 You may have heard the phrase 'taking the waters' - this refers not only to bathing in the warm springs in order to heal illnesses as serious as leprosy, but drinking gallons of the stuff - the audio guide said up to 5 litres and all before breakfast! The baths are now preserved as a walk-through historic site, with a really informative and enjoyable museum full of amazing Celtic and Roman finds from the site. You first enter on a terrace above the bath, which was added in the Victorian era with many statues of Roman gods on plinths. 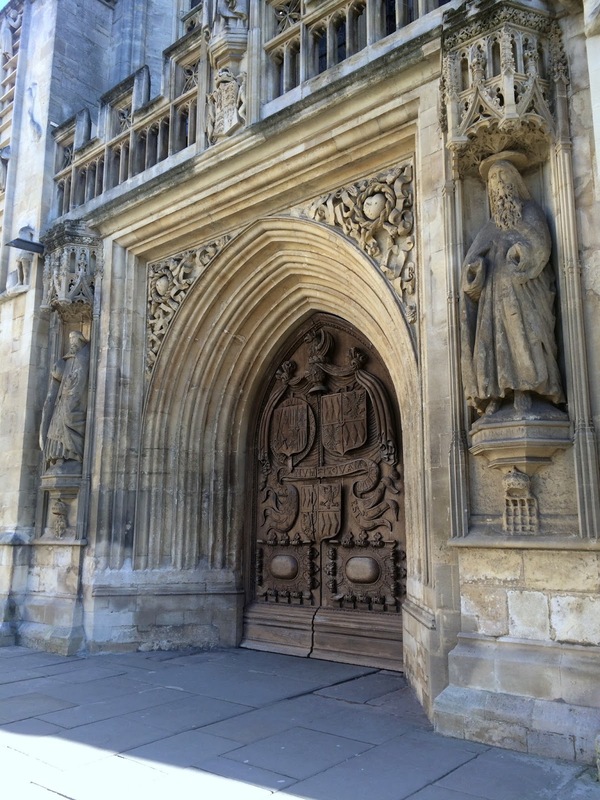 Luckily we visited on a beautiful day (sorry for the over-exposed photos - I only had my phone on me - have you noticed how often I apologise for terrible photos? 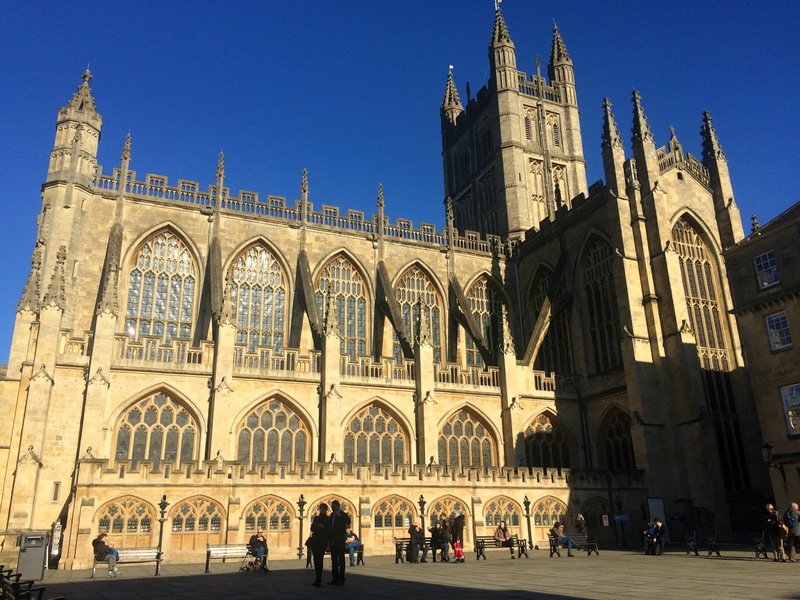 I'll get my act together one day, promise) and the abbey looked stunning standing behind the baths. Above is a picture of the Sacred Spring. This is where the water actually rises (with a temperature of 46°C! ), and the water flows into the main bath in the temple built adjacent to the spring. A pool in the East baths complex. 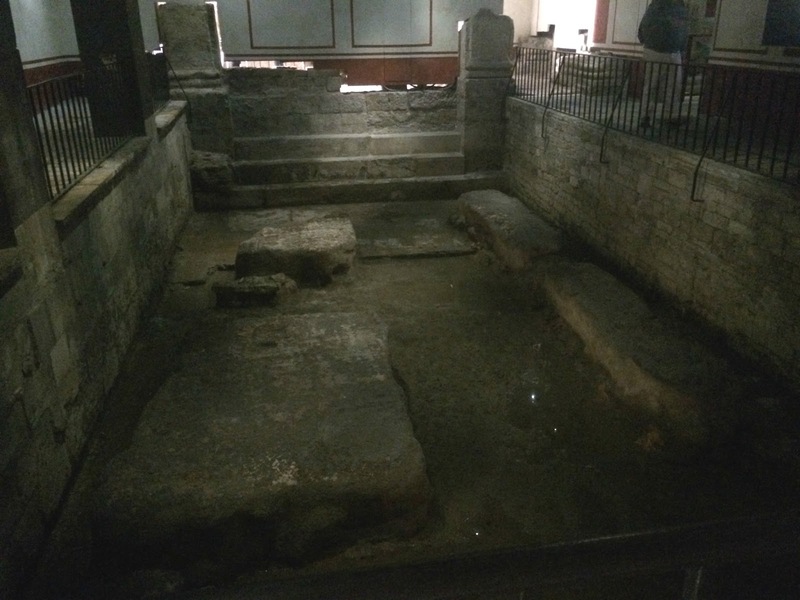 You can see the original steps that bathers would use to step into the water. One part I really enjoyed was seeing the full bathing complex. Taking a bath was a bit more effort than just turning on the taps and chucking in a bath bomb. The first room a bather would enter is the tepidarium, or warm room. This would help to warm the body up before entering the caldarium, or hot room. This room would be quite similar to a modern day sauna in terms of being a hot and steamy environment to help open up your pores. Once you'd begun to sweat, a slave would rub your body with olive oil and scrape it off with a tool called a stirgil, removing any dirt, sweat and oils from the skin. You'd then go back into the tepidarium, before entering a cold pool in the frigidarium, closing your pores and cooling you down. Now you're ready for the main baths! This area was really interesting to me, as I hadn't realised how much time and effort went into the procecss. It was also amazing to see the hypocaust heating system - tile stacks that held up the floor, allowing hot air to circulate underneath and keeping the temperature nice and toasty! Above are some pictures of the spring overflow, which drained excess water from the Sacred Spring into a drain, and onwards into the River Avon. It's pretty impressive to see Roman engineering up close, and see that they were so ingenious that it's still working 2000 years later. Seeing the water still flowing down the routes they'd manufactured so long ago, and still with steam rising up, made you realise why it was so special. 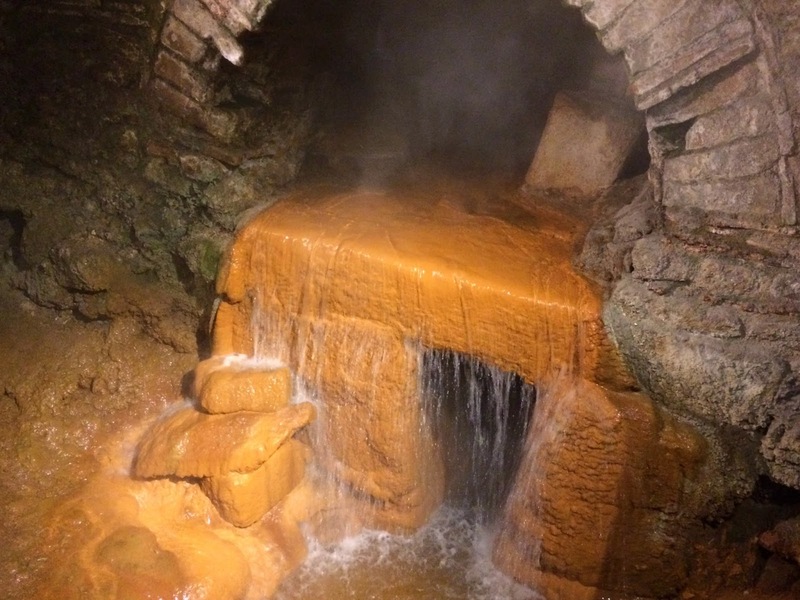 I won't lie, I still don't fully understand how or why hot springs form, but if someone told me two thousand years ago that it could cure you of basically anything, I'd probably have believed it. Before I went in, and especially after spending so much on a slightly lacklustre trip to Warwick Castle the day before, I was a little nervous about spending 15 quid on a ticket into the baths. However, I've got to say I was so pleasantly surprised by the site. I found it absolutely fascinating and we spent a good three hours there investigating it all. 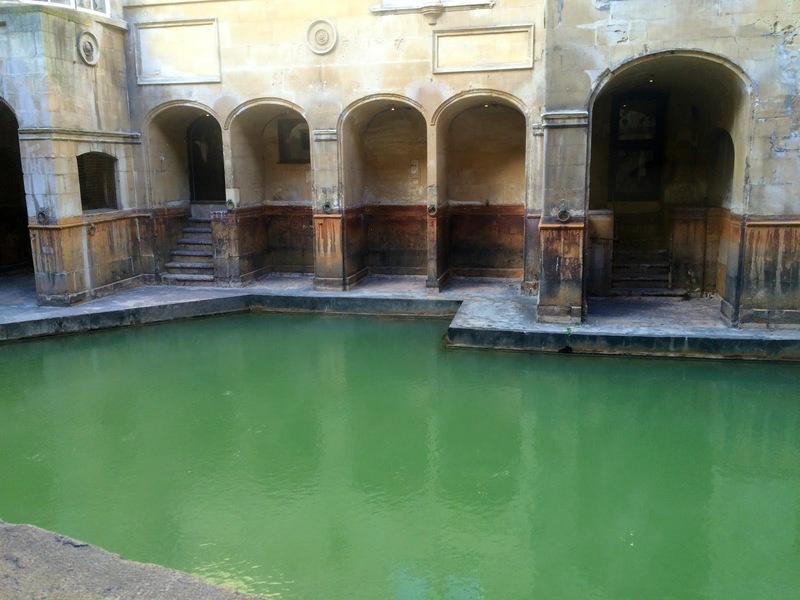 Whether or not the waters actually have any healing properties is debatable, but the fact is that the water in the main baths is now unsafe to even touch, never mind drink. However, you still get the opportunity to taste the waters at the end of the tour. It contains 43 minerals with high concentrations of sodium, calcium, magnesium, silica and iron, and it's warm. I'd encourage any visitors to the spa to try it, but it isn't the most pleasant drink I've ever had...! The water is also served from the neighbouring Pump Room restaurant. This building was a meeting place for the Georgian upper classes, coming to take the water and is mentioned in two Jane Austen novels. 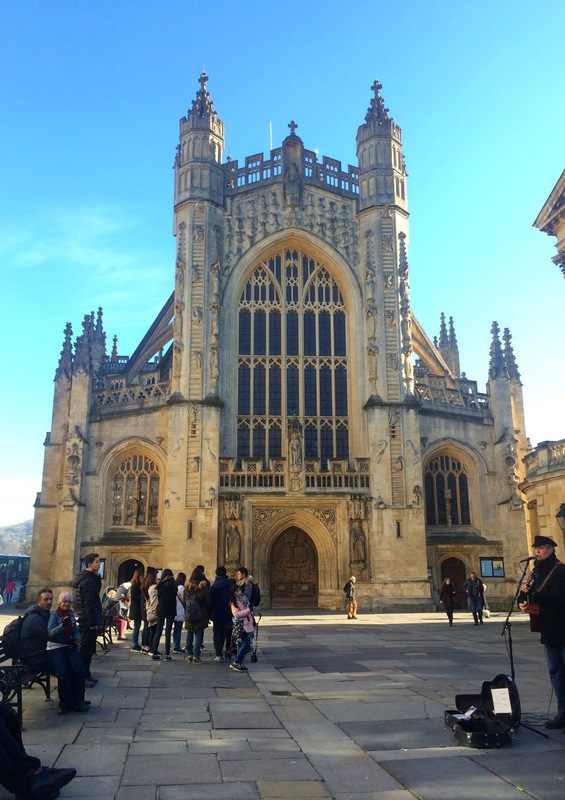 The increase of visitors to Bath resulted in the building of some of the most gorgeous architecture I've seen. Particularly famous is the beautiful Royal Crescent, 30 terraced houses with their exteriors unchanged for over 230 years. There's a hotel in the central house, and it's now a personal dream of mine to spend the night there... we'll see! 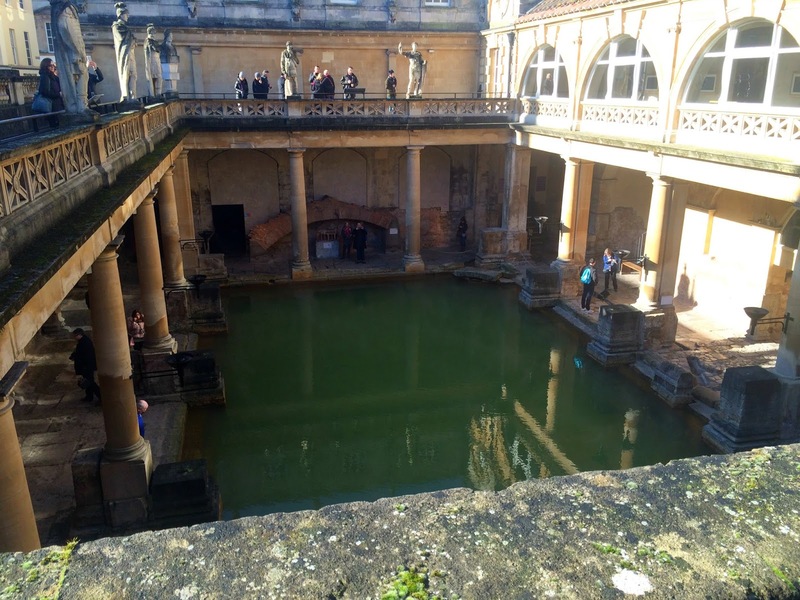 Bath was such a lovely day out for us, and even though Roman history hasn't necessarily grabbed my attention before, I found the baths fascinating and a really enjoyable insight into the personal and social lives of their wealthiest folk. I liked that it was so detailed and (tumblr phrase coming up) relatable. Getting to see what pissed off Romans were writing to their goddesses made me really think of them as humans rather than an ancient warrior race. It was a really great day out. 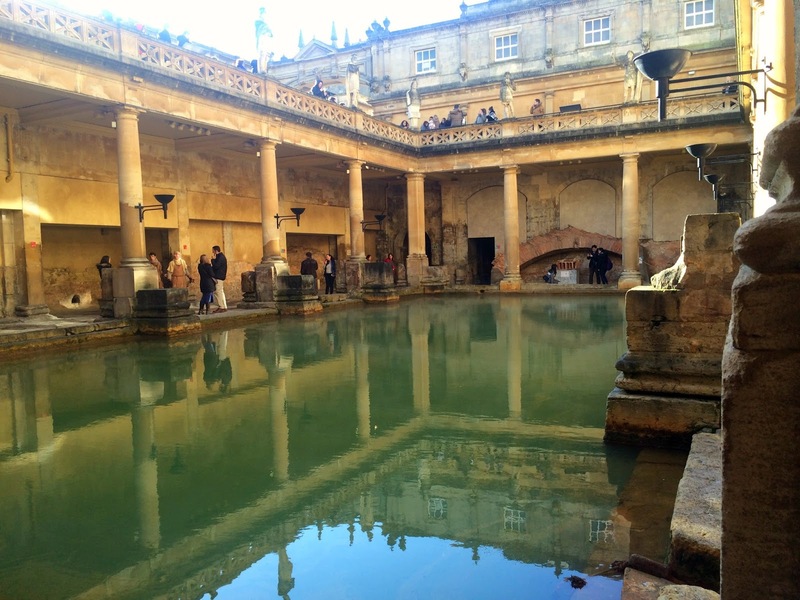 Have you ever been to the baths, or would you like to go? 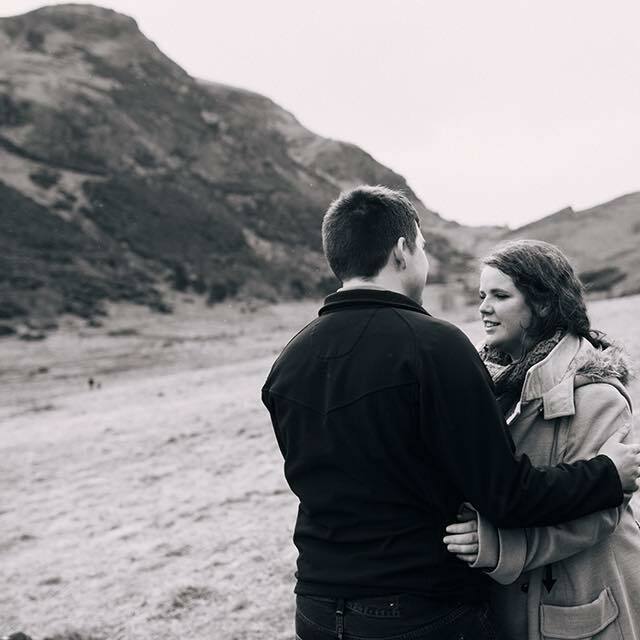 Glad you had an amazing time, thanks for sharing!